"In 1993, the Riverside Library, the City of Riverside, downtown merchants and civic leaders established the Riverside Charles Dickens Festival, an annual street fair with a number of special attractions focusing on the social and cultural activities of Dickens era London. Most of the festival activities occur on Mission Inn Avenue in the block fronting the First Congregational Church. 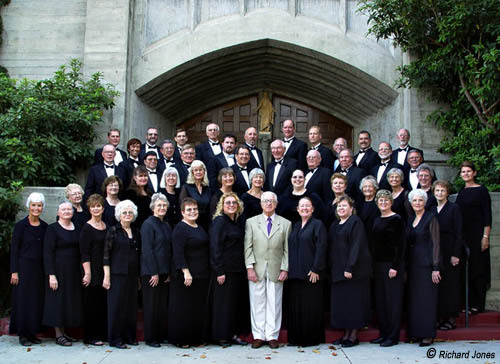 "In 1996, Professor John T. Hamilton, Founder and Director of the John T. Hamilton Chorale, conceived the desirability of presenting, in connection with the Festival, a British Evensong in the Church. His request was approved, and he conducted a new group, the Riverside Choral Artists, in a Festival Evensong each year, 1997-1999. In late 1999, Steve Kester, Choir Director and Organist of Victoria Presbyterian Church, was asked to organize a group to present evensong in 2000. The group eventually became the Raincross Chorale, which continues this annual cultural event in the First Congregational Church." In addition to the annual Evensong Service in February, the Chorale presents concerts in the Spring and Fall. The Chorale also awards scholarships to worthy vocal students in the greater Riverside area, and these young singers are featured in the Spring concerts.